Spice Box Designs: Bead Buzz! Don't you just love that title! 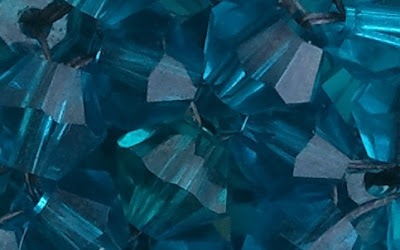 I saw it on Bead and Buttons website and decided that maybe I should use it to make a post about it. I love Bee's. Not real ones of course, they hurt! But the cartoony kind. There is just something so happy and cheerful about them. So when I saw that title on B&B's page I just knew that it was good news and for a pattern collector like me it really was. So if you are a pattern collector as well you can go here for several free beading patterns. I made the pendent in the top right corner as my first piece ever. Being completely new to beading I did not have the required materials needed for it so I improvised. Where I live the only beading store we have is Hobby Lobby and I purchased all my mats from there. Needless to say I was really happy with the way it turned out even though it really only favors the one made by Marcie because I did not have the correct materials. At the time I had no clue that cylinder beads were actually another name for Delicas so I just used regular size 11/0's since that is all that was available to me. And of course I used plain round 4mm's beads that I now know are dyed (ugh) and imperfect (see the dimple). In a few months (May) will by my first anniversary with the little seed beads and I am very pleased with where I am today concerning my progress. Sometimes I even surprise myself with how well things turn out now. Don't get me wrong, I realize that I have a long long way to go before I master this, if it is ever able to be truly mastered. Because I am not completely comfortable on my own yet I almost always use some type of pattern for my work, But today I went outside my comfort zone and created a piece that is entirely mine in design! Yes it is simple, and yes it is using techniques that we all use but the composition of it is entirely my own and I have to admit that I am tickled pink. I would love to show it to you but it is my piece for the 7000 bracelets for hope blog hop that I am participating in and the official reveal day is not until the 25th. So until then all I am going to show you is a sneak peak. Marla, Wow! 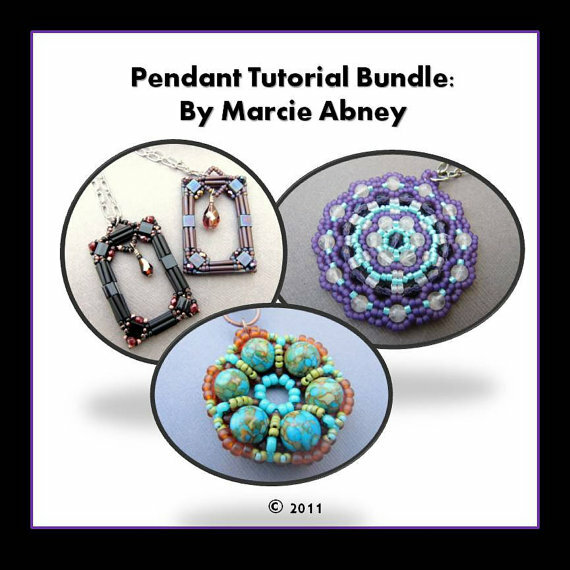 I have that same tutorial and I must say that it is fantastic for your first beading project. I did that one too and mine came out all wankey! I now know it is because I used to heavy of thread. I can not wait to see what you did for the 7,000 bracelet hop and It is super that it will be your own design. The Mother that gets it will be so special cause it is your first original piece. I was over all pretty happy with the way that it turned out even though it does not really look like Marcie's version. I gave it to my best friend at her going away party before she moved to your side of the pond lol (saraland, alabama) It reminded me of Van Gogh's Starry Night. I hope the mother enjoys it as well :) It is very simple in design but I think that is what makes it so special. I hope you are doing well Therese! 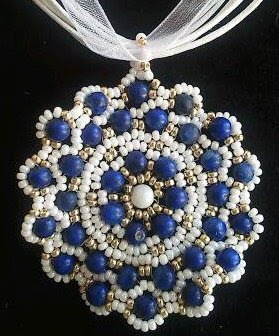 Your first beading project is involved and fantastic! Upon first glance, Holland Delft came to mind and then I saw in your comment to Therese that it reminded you of van Gogh's Starry Night. I love anything van Gogh-ish so no wonder why it grabbed me. He is my obsession.